i've been going through some old photos & organizing them with the hope that i will find the time to sit down & actually write some blog posts! halloween is just around the corner so i thought it would be the perfect time to revisit some costumes from years past. 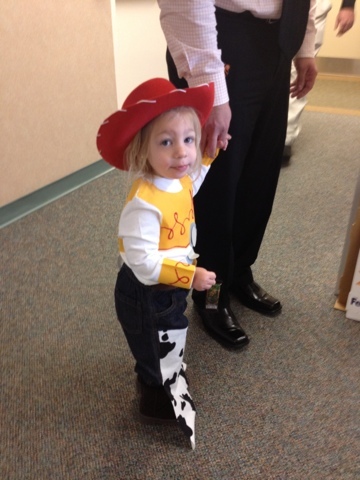 when my oldest daughter was 2, she was starting to form opinions about her wardrobe & seemed pretty excited about the thought of dressing up as a character. 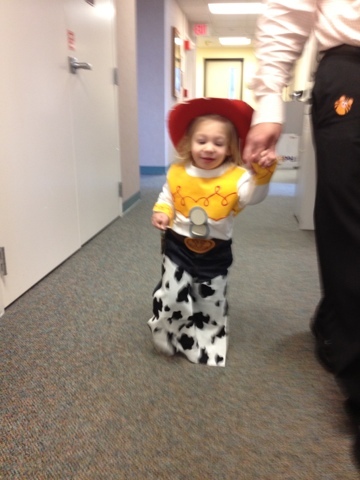 she hadn't quite discovered princesses yet so it was easy to convince her that toy story costumes would be perfect! i am going to apologize in advance for the photo quality. these were taken on my iphone, in terrible lighting & no amount of editing was going to make them look good (not that i'm huge into photo editing anyway). so i just left them as is. 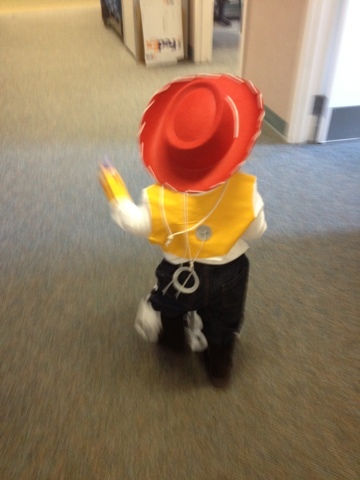 have i mentioned that i LOVE halloween? 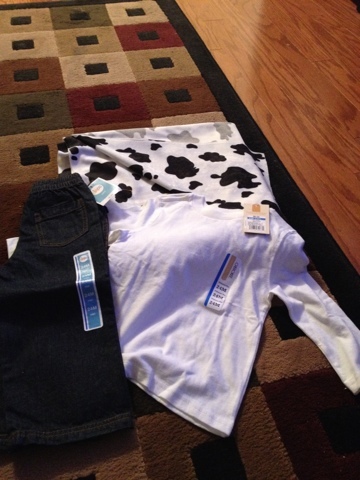 (check out some of my costumes here). now that i have kids, i have an excuse to trick or treat again. 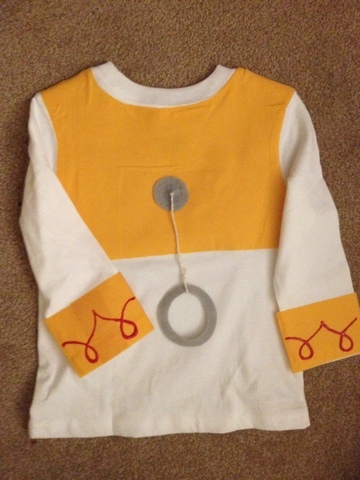 nothing against store-bought costumes (they are much better than the plastic masks & smocks i got to chose from when i was a kid), i just really enjoy the process of putting together costumes myself. and of course there has to be some sort of theme. for the shirt, first i applied the heat n bond to the back of the yellow cotton fabric according to the directions on the package. then, i traced the shape i wanted the final size to be onto the paper backing of the heat n bond, using the shirt as a guide. 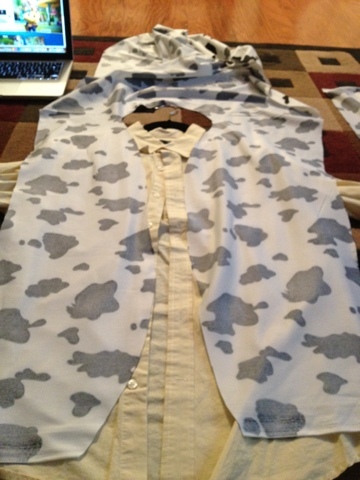 i did his to both sides of the shirt & cut each piece to the shapes i wanted. 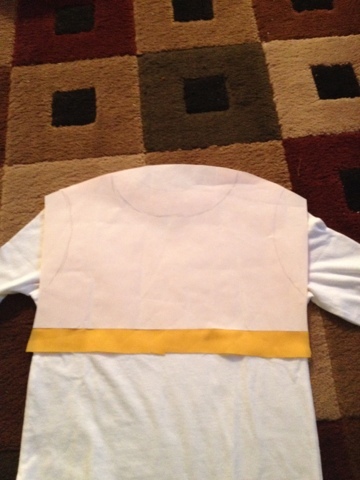 i applied the yellow fabric to the front & back of the shirt, placing the ironing board inside the shirt so it didn't end up glued together! i made the cuffs from 2 strips of yellow fabric & attached to each sleeve using the heat n bond. 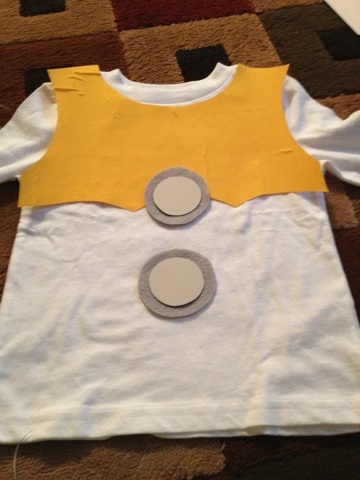 i cut 2 circles from the darker gray felt & 2 slightly smaller circles from the lighter gray felt & glued them to the front of the shirt, using hot glue. i penciled in the red embroidery detail on the front of the shirt & the cuffs & carefully traced over it with red puffy paint. i used the darker gray felt & string for the back pull-string detail. 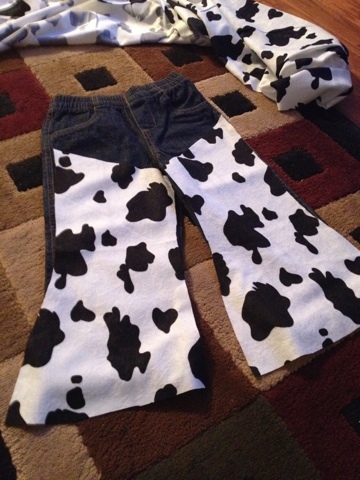 next, the pants... i placed the jeans on the cow-print fabric & traced the leg shape with an extra flare added below the knee. 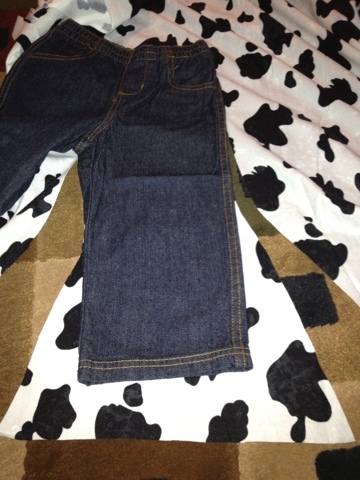 i did this for each side, then i attached (using heat n bond) the cow fabric to the jeans, just on the top part of the jean legs to the knee, leaving the lower half free. 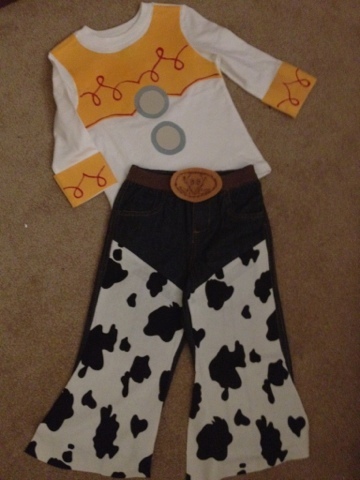 i added the belt using curved strips of dark brown felt & the belt buckle was light brown felt with the hand drawn detail in sharpie, both hot-glued to the jeans. 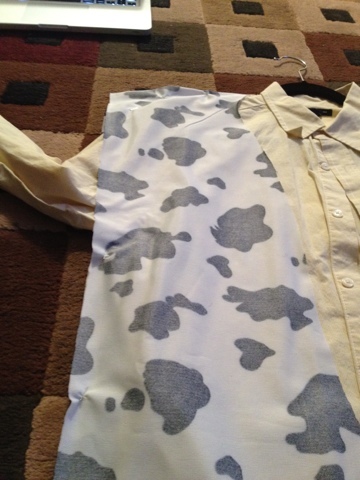 i used one of my husband's button-down shirts as a guide & cut the cow-print fabric into a the vest shape i wanted. then i pinned the top around the shoulders & sides under the arm holes while it was inside out & stitched it by hand (quick, nothing fancy since it was hidden anyway), which made it pretty close to the correct shape. and here's the whole toy story family! 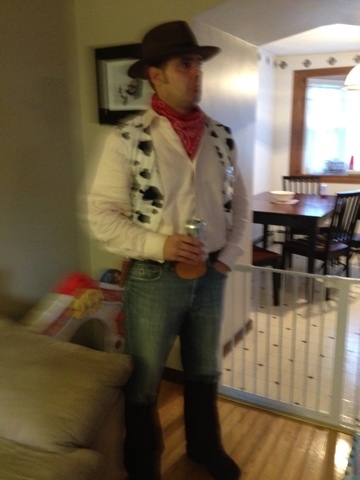 ok, so i kind of cheated with my costume. at this point i was about 6 weeks pregnant with baby #2, right at the start of my constant nausea/total exhaustion trimester (not to be confused with my constant back-ache/total exhaustion trimester). 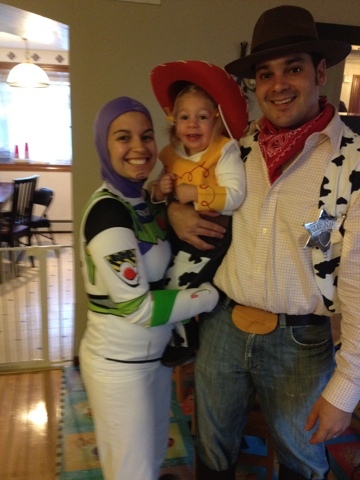 i used a kids buzz lightyear full body costume (i'm 5 feet tall, adult costumes don't fit me). the fit was a little snug so i cut it below the belt detail, turning it into a shirt. i wore it with white sweatpants & buzz lightyear gloves, which covered up the fact that the sleeves were too short, then i drew a spiral on my chin with brown eyeliner & called it a day. well, my daughter loved our costumes. she was happy so that's all i really care about! how about you? store bought or home-made or, like me, a combination of both? i am a wife, a momma and all around creative person. i have 2 adorable daughters (luciana & anabella) & a hubby who's a bigger handful than our girls. i have my own business designing and making invitations called echo art and design but also love to draw, paint, cook, entertain, sing, dance, read, take photos, write, decorate... and blog! © 2011 - 2015 art d'echo all rights reserved. Simple theme. Theme images by UteHil. Powered by Blogger.